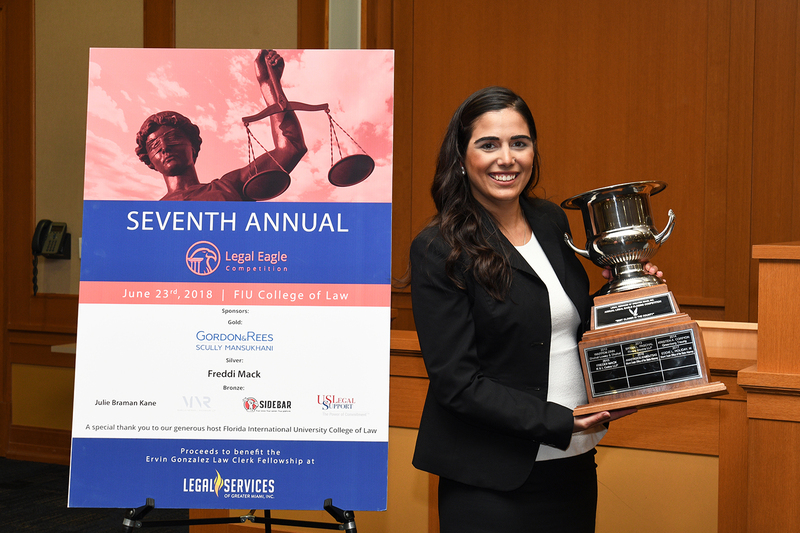 Victoria San Pedro Madani, an associate in the Miami office of Shutts & Bowen, won the 7th Annual Legal Eagle Closing Argument Competition held on Saturday, June 23. This competition, open to attorneys in Miami-Dade County who have been practicing for 7 years or less, consists of several rounds of arguing both the plaintiff’s and the defendant’s positions. Facts and materials are released 72 hours before the competition begins. Competitors learn which side they will argue the morning of the competition, and argue both sides of the case during the competition. More than 30 attorneys under 40 years of age argued before a panel of private practitioners and sitting judges. The event was held at the Florida International University College of Law. Proceeds from the competition serve to benefit Legal Services of Greater Miami. Victoria San Pedro Madani is an associate in the Miami office of Shutts & Bowen LLP, where she is a member of the Class Action & Mass Litigation Practice Group. Prior to joining the firm, Victoria was an associate at a regional firm where her practice encompassed all aspects of civil litigation. Victoria represented airlines in complex litigation, with representative experience in cases involving international transportation treaties. She also has experience defending corporations in wrongful death, personal injury, and premises liability matters.